“They Branded Him an Outlaw!” says it all. This dynamic man is the “little guy,” the proverbial clever tailor who can knock down an armed giant/gunman with a flip of his lariat. Go ahead and try it, any of you. Unless you’re a rodeo star, you’ll put your eye out. The hero’s red shirt blazes with righteous indignation; his straight teeth are gritted with determination; his aim is sure. He will prevail against this gunman, although he himself has no gun. What bully would fire on an unarmed man? Easy! “Man branded outlaw” must mean western plot #3, in which the innocent hero is bullied by (take your pick) big business ranchers or greedy bankers. If you can beat them, then join them. Badlands is clean, crisp western penned by Bennett Foster, and this Bantam edition is crowned with a swirl of action from one of the great pulp and paperback illustrators, Norman Saunders. 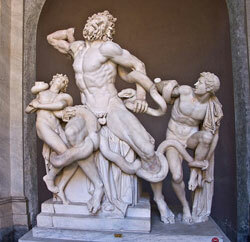 His compositions are always dynamic; this one’s Day-Glo vibrancy highlights a climactic moment in the book, when the hero of the story, in Laocoön-style composition (but without the grisly death), frees himself of his tormentor. Squint, and you’ll see the resemblance. 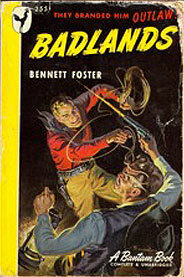 Saunders illustrated a wide range of paperback covers, specializing in vamps and virile men of noir and western genre. Like Stanley, Saunders often used himself as a model. He studied under Harvey Dunn in Minneaopolis (as did Norman Rockwell) and in the thirties and forties worked on pulps like True Confessions, then turned freelance. This fine illustration is one of ten western covers he did for Bantam.